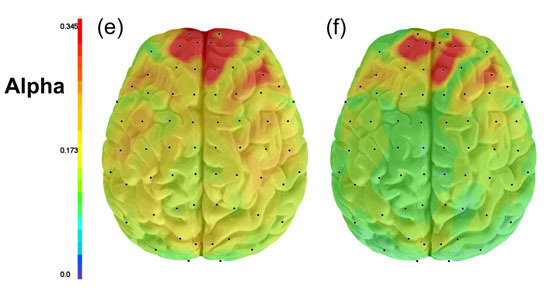 Maps showing the difference in the strength of brain connections between depressed subjects (left) and controls (right). Depressed subjects show much stronger connections, as evidenced by red colors in their maps. Researchers at UCLA have shown that people with depression have increased connections among most brain areas. While studying the functional connections of the brain in 121 adults diagnosed with MDD, they found that the depressed subjects showed increased synchronization across all frequencies of electrical activity, indicating dysfunction in many different brain networks. Be the first to comment on "Researchers Study the Link Between Hyperactivity in the Brain and Depression"